Information on boat light types and systems. Of all boat-parts cabin lighting is probably one of the most neglected of all boat electrical systems. Poor planning and equipment selection generally results in unexpectedly high electrical power consumption rates and poor illumination levels. Not to mention those infuriating failures at sea when you need them most, and the flashlight has dead batteries etc. The subject of cabin illumination is not as simple as it first seems. 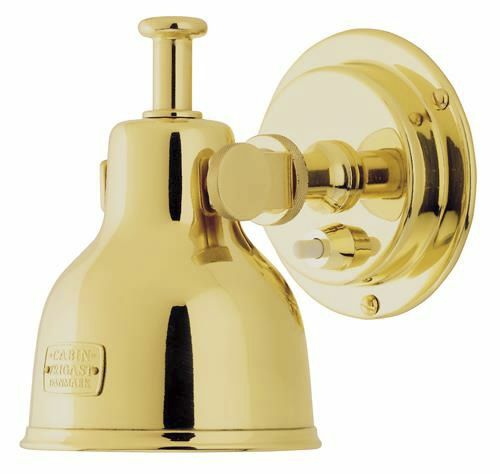 After spending big money on boat-parts for the rest of the boat, often the lighting fittings are purchased on the basis of cost alone, followed by aesthetic considerations. Usually this is a hurried visit to your local boat-parts dealer. This is not that surprising, as a quick calculation of those beautiful fixtures from the West Marine boat-parts catalog can cause a momentary heart stoppage and a very big and long breath through clenched teeth. 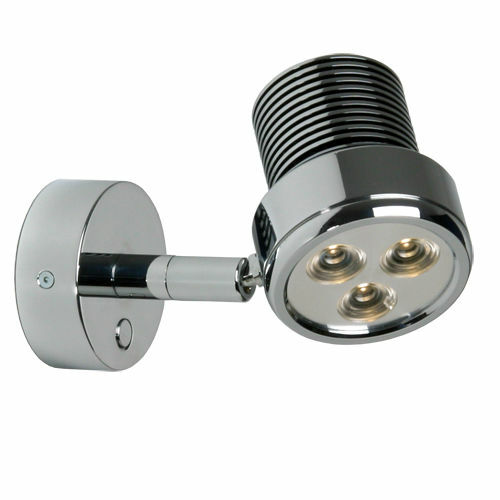 It is easy to spend a $1000 on lighting fittings that usually blows the boat parts budget. 1. What purpose is the fixture going to serve in the proposed location? 2. How big an area is required to be illuminated? 3. What is the level of illumination required? 4. How reflective is the area in which the fixture will be installed? 5. How long will the lighting fitting be on for in the chosen area? 6. What light fixture style is required for surrounding décor? 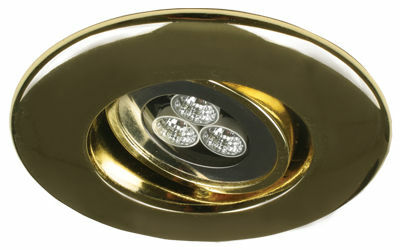 The proposed purpose of lighting fixtures is an important consideration. They may be for general cabin illumination, or for bunk reading, work surface illumination in the galley, or illuminating the engine spaces. Each location has entirely differing requirements. Lights are more than just the average boat-parts, they are essential safety equipment. The incandescent fixture with its filament bulb is power hungry for the given output and they suffer from physical degradation due to vibration, and with the life being shortened in over-voltage conditions with fast charge devices. As you have seen on your boat-parts forays, the shelves are full of cheap and nasty fittings. 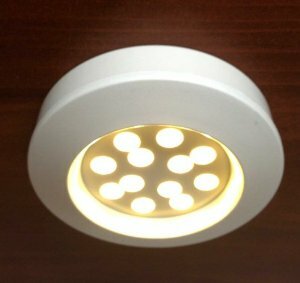 The fluorescent boat light fixture has a much higher lumen output over the incandescent for significantly less power consumption. Like all fixtures they have drawbacks. The most notable is that most cheaper fittings are badly suppressed against RFI interference, with often serious consequences for radio communications such as noise. The cheaper boat-light fittings seen on so many boat-parts chandlers shelves also have similarly cheap inverter electronics, with a subsequently higher rate of failure, and a much higher tube failure rate as well. The low energy fitting is relatively new, however low energy fluorescent tube types are to be seen everywhere ashore and increasingly afloat these days. These have a very high lumen output for the power consumption. Typically a 75 watt bulb output for around 1.2 amps on 12 volt DC fittings. Most of the DC boat-light fixtures being made are tolerant to over voltage with quite high quality inverters, and like all European made equipment these days, they have suppression against RFI. The tubes are not cheap and are on a par with halogens. The halogen or HQL type has advantages that they are simple, and have high light outputs for the power consumed, with the average light having a 10 watt bulb. There are a few disadvantages, the main ones being that if you inadvertently touch a bulb, the life of it will reduce considerably as the contaminants off a finger such as sweat etc degrade the high quality glass. The bulb itself is subject to quite high temperatures. The cost of the halogen-bulbs are rather expensive, typically around $8-$10. Additionally bulb life shortens considerably in over-voltage situations, typically this occurs when electrical system voltage rises to 14.6 – 15 volts under-charging or engine run situations. They do have the advantage of being dimmable which significantly lengthens bulb life, and this is recommended, also unlike fluorescent lights, you do not have an inverter to fail.